​Fast Food: Fast Track to Obesity and Disease? ​is highly processed with high amounts of sodium, saturated fats and trans fat. The next time you crave for a double cheese hamburger, think of the whopping calories, saturated fats, and high amount of sodium that go into this fast food meal. Dietitians and nutritionists have long singled out eating fast food as a fast track to obesity and disease. According to the Ministry of Health’s National Health Survey, Singaporeans have grown fatter over the past seven years, with the obesity rate rising from 6.9 per cent in 2004 to 10.8 per cent in 2010. More people are also developing type 2 diabetes. This type of diabetes occurs when the body becomes insulin-resistant and is closely linked to obesity. The sharp rise in obesity and type 2 diabetes among Singaporeans over the past seven years is alarming, say specialists at the Department of Endocrinology, Singapore General Hospital (SGH), a member of the SingHealth​ group. It is a worrying trend that is set to rise unless Singaporeans adopt a healthier lifestyle. Experts cite poor eating habits such as eating fast food, late night suppers, rushing through meals and eating while watching television – as reasons for poor digestion, overeating and rising obesity. The convenience of fast food and hawker food also makes it harder to break poor eating habits. With obesity comes a host of health problems: joint pain, sleep apnea, high cholesterol, high blood pressure and heart disease. Most fast food rank high on the glycaemic index (GI). The body digests high-GI foods quickly, converting it into glucose that’s released into the bloodstream. Normally, insulin transforms this glucose into usable energy. However, if you are insulin-resistant, glucose remains in your bloodstream for too long, damaging your organs. Most fast food is highly processed with high amounts of sodium, saturated fat and trans fat. 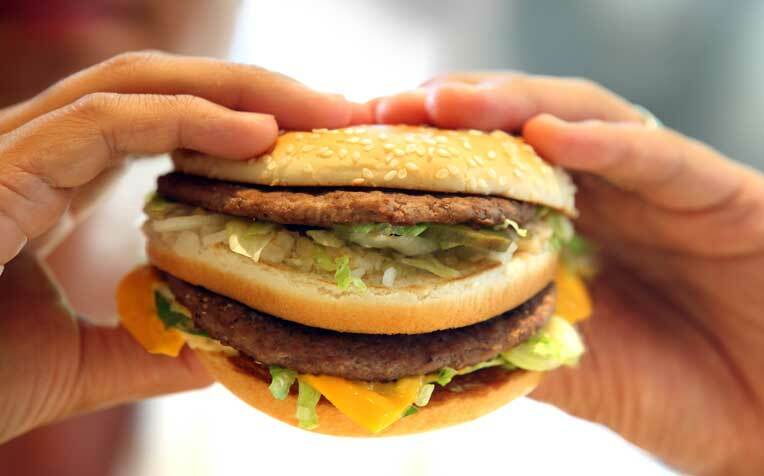 One Big Mac meal with medium fries and medium coke will chalk up 70 per cent of your daily maximum sodium intake, and up to 60 per cent of your daily maximum saturated fat (20g for women, 30g for men). Saturated and trans fats raise so-called “bad” LDL-cholesterol level. High LDL-cholesterol clogs heart arteries and raises blood pressure. It can trigger heart disease and strokes. Because processed foods are stripped of nutrients, they can never satisfy the body’s nutritional needs. You end up eating more. Avoid fast food and oily hawker food. Choose healthier options such as soup-based dishes, non-fried items, more fruits and vegetables. For better digestion, do not eat too fast. Wait a while before going for second helpings as the brain takes about 20 minutes to register you are full. If you must snack, choose healthy substitutes such as almonds and sunflower seeds – in reasonable quantity - instead of fries, biscuits, crackers and sweets. Local kopi and teh si are sugar-loaded. So are soft drinks and canned fruit juices. Quench thirst with plain water instead. Poor eating habits and sedentary lifestyles are factors that cause obesity. Get enough physical activity. Walk more, eat less, and eat healthily. Fast food is convenient, but it is not real food.